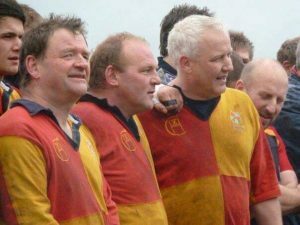 Alan was a big stalwart second row, known for the occasional impromptu drop goal. Alan was our globetrotting President in the 80s and 90s. His picture is in pride of place over the Martyrs fireplace. 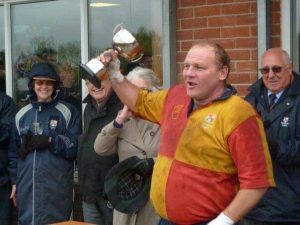 The picture was published in Rugby World as the archetype rugby ‘Golden Oldie’ a role that Alan filled perfectly. Always happy to play, and was never without a drink in his hand … Alan would be seen at the Hong Kong sevens, with England or the Lions on tour or at Twickenham. Alan’s globetrotting benefited from his job at Garuda airlines, and the Club and club members also benefited from Alan passing on the chance of concessionary long haul tickets. If ‘Rupert the Bear’ was sung in the club, you knew Alan had arrived – he had dreadful taste in loud check trousers. When Alan retried as President and moved to Cornwall, the Club renamed the 10 year Cup in his honour. 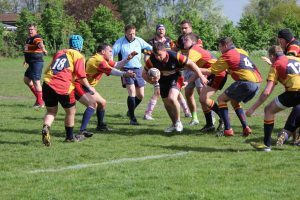 The ‘Ten Year side’ who had put in ten or more years of service to Chobham Rugby would play a Club side in an the end of the season celebratory game. The first game was played in 1978. The ten-year side play in scarlet and gold quarters rather than the hoops worn then. These quarter checks are enshrined as part of the Club shield. Alan sadly died of cancer, but is survived by Margaret (Marc) his widow and Guy his son. 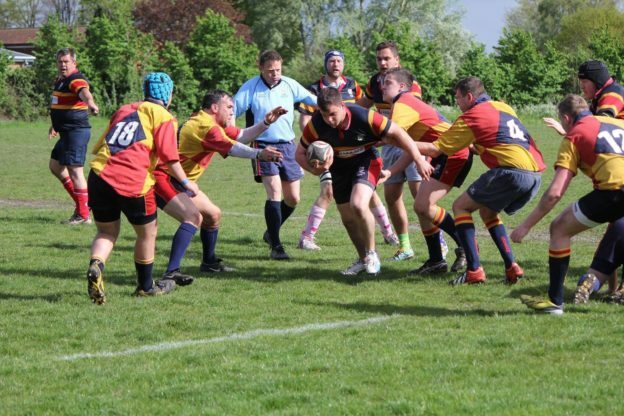 The Pinfold Cup is open to all players from across the club so If you’re interested in playing in the Pinfold Cup please pass on your details by email to eigher Neil Gadsby or Itor James (neilg02@live.com itorjames@hotmail.com) or via the event on Facebook. The game will kick off at 14:30 on Saturday 27th and all players should meet at the club at 1:15 to register. 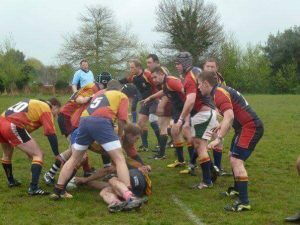 There will be a normal after game dinner which is FOC to all fully paid up members of Chobham RFC and £6 to non members.